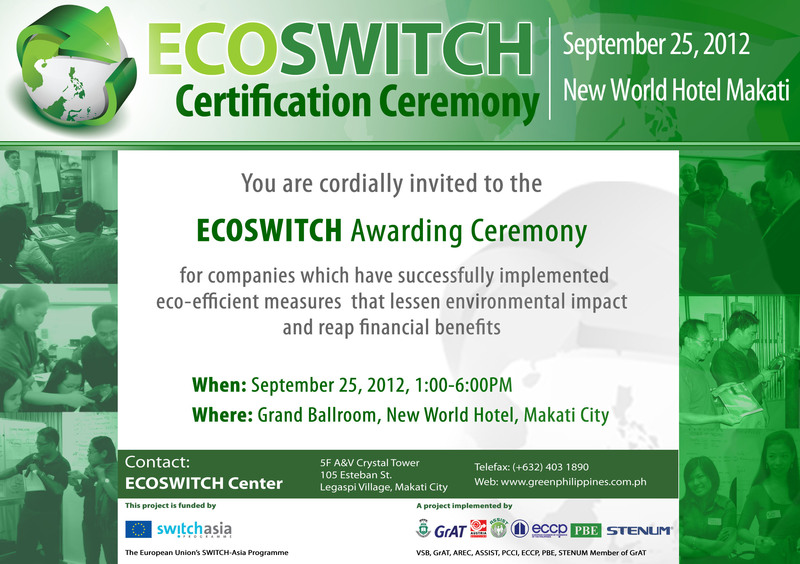 Green Philippines Islands of Sustainability, a project funded by the European Union’s SWITCH Asia Program will honor 150 companies at the ECOSWITCH Awarding Ceremony at the New World Hotel in Makati on September 25, 2012, 1 to 6pm. 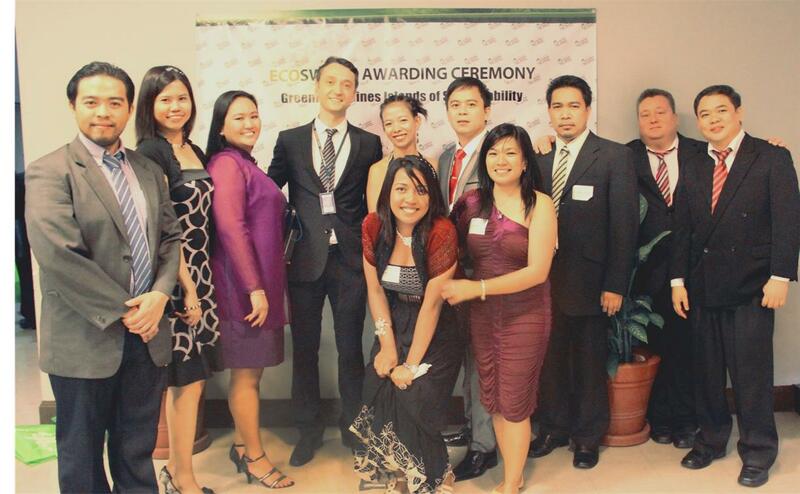 The ECOSWITCH Awards marks the end of the second phase of the four-year initiative (2009-2013), which sought to contribute to an improved environmental and sustainable industrial development of Metro Manila and CALABARZON regions. It will recognize the companies which successfully implemented environment-friendly measures within their organization. Among the awardees are Kraft Foods, Inc., HAVI Logistics Philippines, Liwayway Marketing, Inc., and Philippine Airlines. Note: Acquisition for the third phase of the project is ongoing. Interested parties may contact the Project Coordinator, Juvy Perez, telephone number: 403-1890 or email juvy@greenphilippines.com.ph. “ASSIST’s Green Philippines Islands of Sustainability (GPIoS) is proud to forge two important partnerships towards the initiative’s sustainability,” explains project manager Juvy Perez. Last December 14, 2011, GPIoS and Plantersbank signed a partnership, bridging the gap of the lack of SMEs to approach financial institutions and effectively access resources. GPIoS will serve as a tool to increase profitability while being environment-friendly, making SMEs more bankable. “GPIoS and Plantersbank share a common goal of promoting sustainable development, and this collaboration includes promoting awareness and compliance of Filipino Entrepreneurs on local and national legislation and policies involving sustainable production and consumption,” says project director Dr. Thomas Dielacher. The partnership will involve heightened use of technology-based assessment and environmental trainings for participating SMEs. Plantersbank with the GPIoS implementing partners will attract more pro-environmental investors and transactions and a well-founded public –private partnership. Plantersbank itself will undergo assessment as part of the GPIoS Phase 2 companies under ECOFOCUS Programme. It will also host workshops for their clients which will participate under the GPIoS ECOSENSE Program. 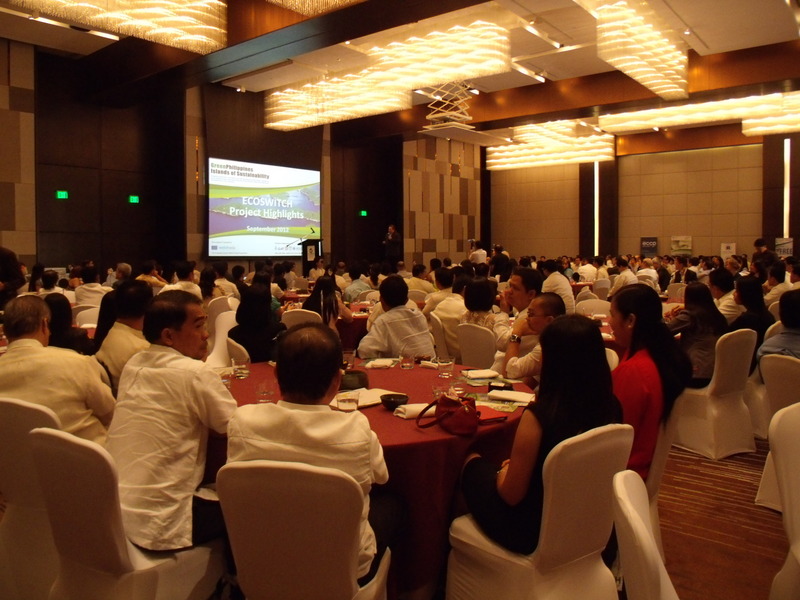 GPIoS also partnered with Philippine Center for Environmental Protection and Sustainable Development, Inc., the secretariat for the National Eco-labeling Program “GreenChoice” Philippines last January 25, 2012, Berjaya Hotel, Makati City. GPIoS and PCEPSDI share a common advocacy for caring to the environment through creating awareness and compliance of Filipino entrepreneurs on local and national policies involving sustainable production and consumption. The experts from GPIoS project will work together with the National Eco-labeling Program-Green Choice Philippines in the development of environmental standards for products. Moreover, the two organizations, with their network of companies will present and promote the “GPIoS shining showcases” to attract more pro-environmental actions and to engage in the National Eco-labeling Program “Green Choice” Philippines. GPIoS is a project that seeks to contribute to an improved environmental and sustainable industrial development of Metro Manila and CALABARZON regions by introducing measures to save on energy, cut down on wastage and promote best environmental practices within organizations. Asia Society for Social Improvement and Sustainable Transformation (ASSIST) Project Manager Juvy Jem Perez and Project Lead Thomas Dielacher presented the accomplishments of the Green Philippines Islands of Sustainability for the European Union’s SWITCH Asia Programme Networking Meeting last October 25 to 27, 2011 at the Le Meridien Hotel in Jakarta, Indonesia. The event was participated in by project managers, Network Facility, the EU Delegation, and representatives of the United Nations Environment Programme (UNEP) and United Nations Industrial Development Organization (UNIDO). Aside from being a venue to check on the progress of each of the 10 SWITCH Asia projects, the activity also served as an opportunity for project implementers to collaborate with policy makers and financial institution, towards the sustainability of the initiatives. The Green Philippines Islands of Sustainability Project Team from the Asia Society for Social Improvement and Sustainable Transformation (ASSIST) held a workshop on energy analysis, hazardous materials and waste management last November 23-24, 2011 at the Berjaya Hotel in Makati City. The workshop is the third in a series of technical training for the second phase of the project. Workshop 1 covered Cleaner Production, while Workshop 2 featured Team-building and Material Flow Analysis. 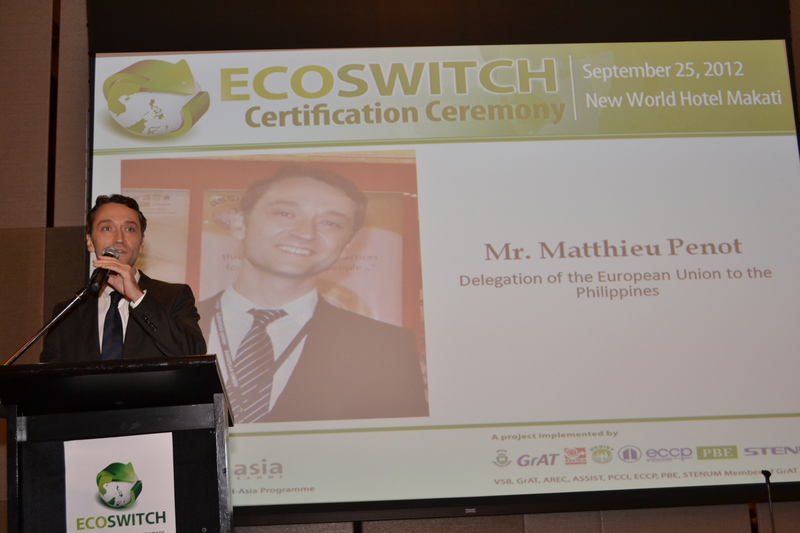 Funded by the European Union’s SWITCHAsia program, the initiative seeks to contribute to an improved environmental and sustainable industrial development of Metro Manila and CALABARZON regions by introducing measures to save on energy, cut down on wastage and promote best environmental practices within organizations. GPIoS Project Consortium is composed of ASSIST, GrAT of Austria, Czech Republic’s University of Ostrava (VSB), Austria Recycling (AREC), Philippine Chamber of Commerce Inc. (PCCI), European Chamber of Commerce of the Philippines (ECCP), Philippine Business for the Environment (PBE) and STENUM. The Green Philippines Islands of Sustainability (GPIoS) initiative of the Asia Society for Social Improvement and Sustainable Transformation (ASSIST) was cited by the European Union for its accomplishments especially in adopting the ECOPROFIT approach in promoting sustainable practices among its participating companies. 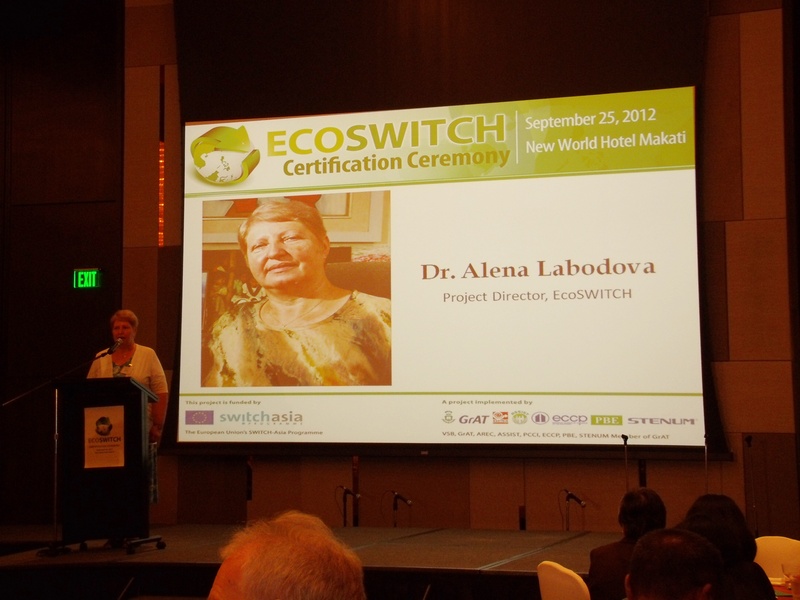 Supported by the European Union’s SWITCHAsia program, GPIoS seeks to contribute to the sustainable industrial development of the Metro Manila and CALABARZON regions by introducing measures to save on energy, cut down on wastage and promote best environmental practices within organizations. Aside from ASSIST, the Project Team is composed of STENUM as part of GrAT (Center for Appropriate Technology) of Austria, Czech Republic’s University of Ostrava (VSB), Austria Recycling (AREC), Philippine Chamber of Commerce Inc. (PCCI), European Chamber of Commerce of the Philippines (ECCP), and the Philippine Business for the Environment (PBE). Accomplishments for the initiative’s first year of implementation include the acquisition of 95 companies, which received free training and consultancy. To mark the end of phase one, GPIoS also handed ECOSWITCH Awards to 72 of these target beneficiaries which successfully implemented sustainable measures based on the triple bottomline philosophy of balanced social (People), economic (Profit), and environmental (Planet) benefits. 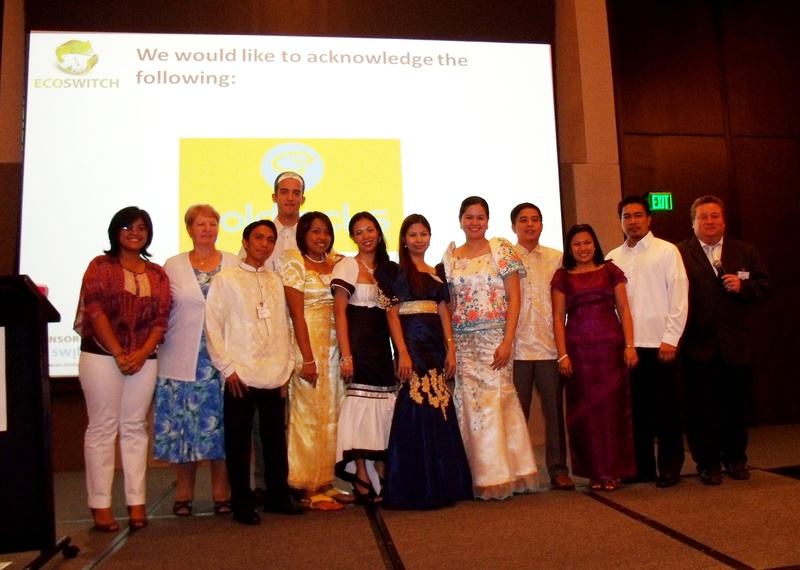 Among the awardees were Lufthansa Technik Philippines, Ford Motors, Panasonic, Philippine Airlines and Toyota. Slated to run until 2013, GPIoS proves that being green is a sound business strategy at a time of rising environmental consciousness. 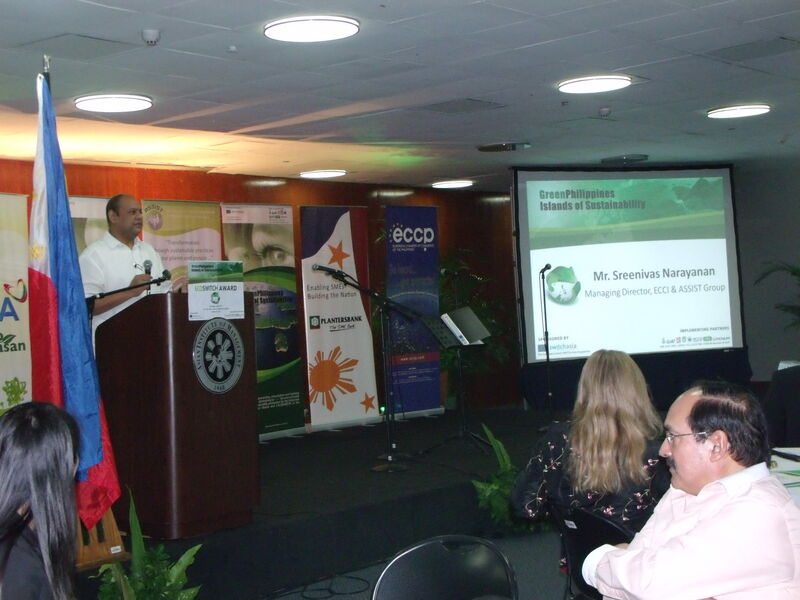 Businesses, government agency representatives and foreign dignitaries convened yesterday, September 22 at the Asian Institute of Management for the ECOSWITCH Awards, which marks the end of the first phase of the Green Philippines Islands of Sustainability (GPIoS) Project. ASSIST Group Managing Director Sreenivas Narayanan welcomes attendees. 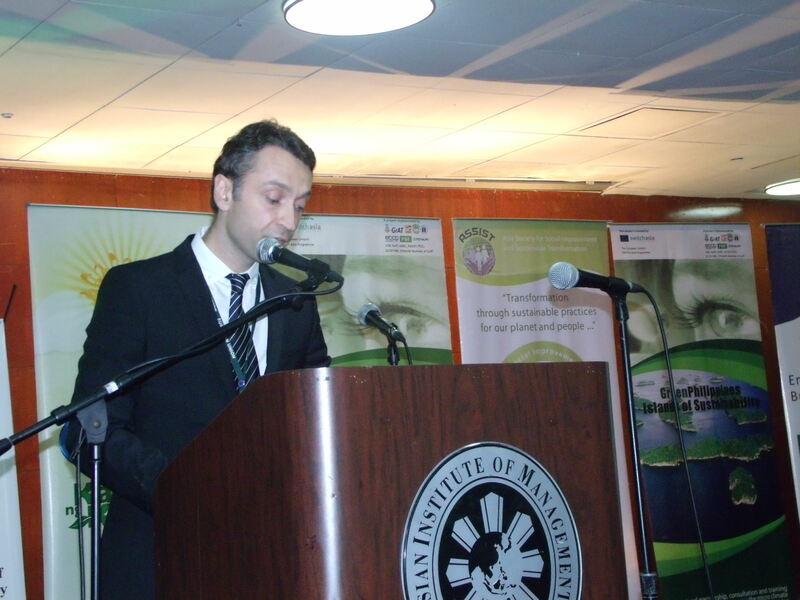 The ceremony recognized organizations which successfully implemented environment-friendly measures in line with the recommendations of the Project Team composed of the Asia Society for Social Improvement and Sustainable Transformation (ASSIST), GrAT of Austria, Czech Republic’s University of Ostrava (VSB), Austria Recycling (AREC), Philippine Chamber of Commerce Inc. (PCCI), European Chamber of Commerce of the Philippines (ECCP), Philippine Business for the Environment (PBE) and STENUM. 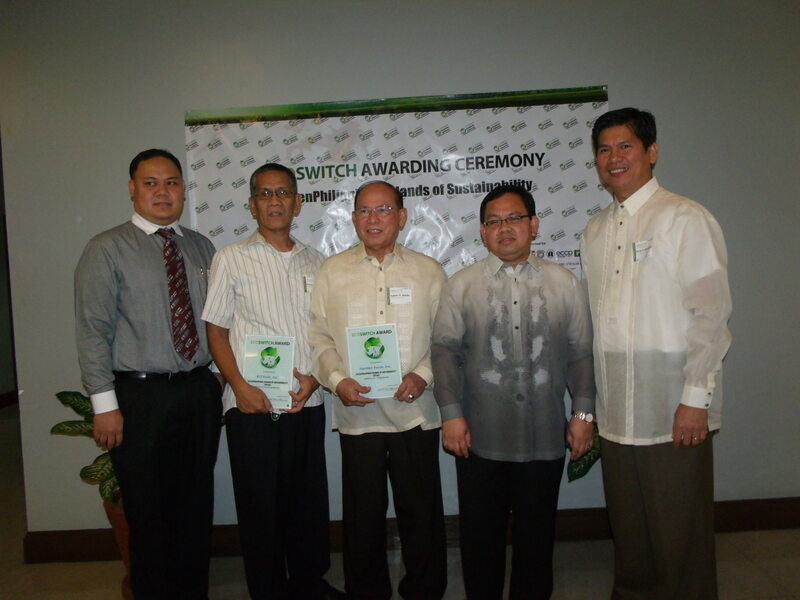 Awardees pose with their ECOSWITCH plaque. ASSIST Group Managing Director Sreenivas Narayanan congratulated the participating companies, for their exemplary efforts towards making the corporate world more environmentally-conscious in their operations. The activity was also graced by Mr. Matthieu Penot of the European Union Delegation to the Philippines, Ms. Susanne Muller of the EU SWITCH Asia Program and Ms. Monika Kazdova of the Embassy of Czech Republic. Atty. 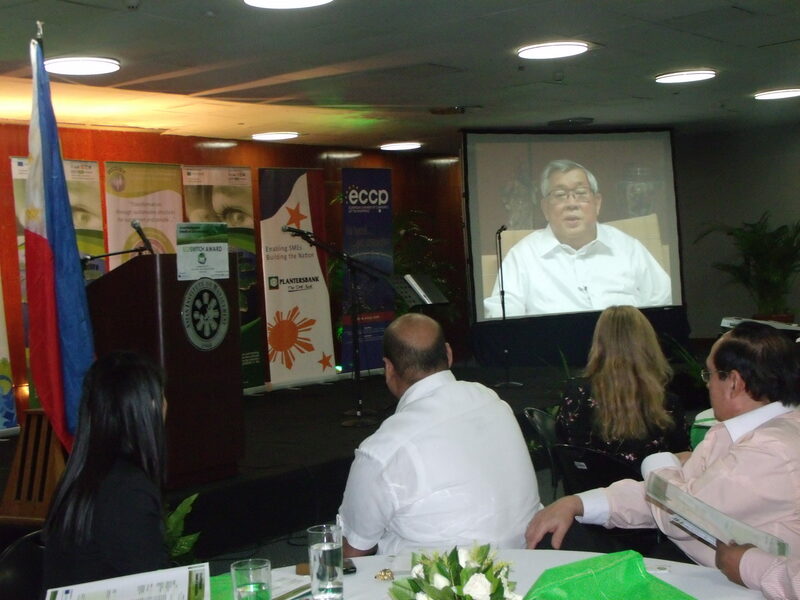 Felipe Gozon, PCCI VP for the Environment and GMA Network CEO sent a video message. From the Implementing Team, Dr. Alena Labodova of VSB, Mr. Bonar Laureto of the PBE, and Mr. Gerry Constantino of ECCP came to honor the participating organizations. Atty. Felipe Gozon, Vice President for the Environment of PCCI and CEO of GMA Network sent a recorded video-message and was represented by GMA Network AVP for Corporate Affairs Ms. Teresa Pacis. Department of Environment and Natural Resources (DENR) USec Demetrio Ignacio also came to deliver a message for the awardees. Among the awardees are GMA Network (GMA7), Lufthansa Technik Philippines, Ford Motors, Maynilad Water System, Philippine Airlines, Panasonic, Mapua Institute of Technology, and Toyota. ASSIST RKM Director Sheena Carmel Opulencia and QTV and GMA Network Talent Steph Henares hosted the event. For more photos, please visit the ASSIST Facebook page.